Welcome to Day 32 of my #100DaysofBulletJournalIdeas Project! If you have special events you'd like to keep an eye on, consider creating a countdown tracker to view them. Here's a super simple version with the date as the first column of numbers and the second column of numbers is the days until the special date you're counting down to. 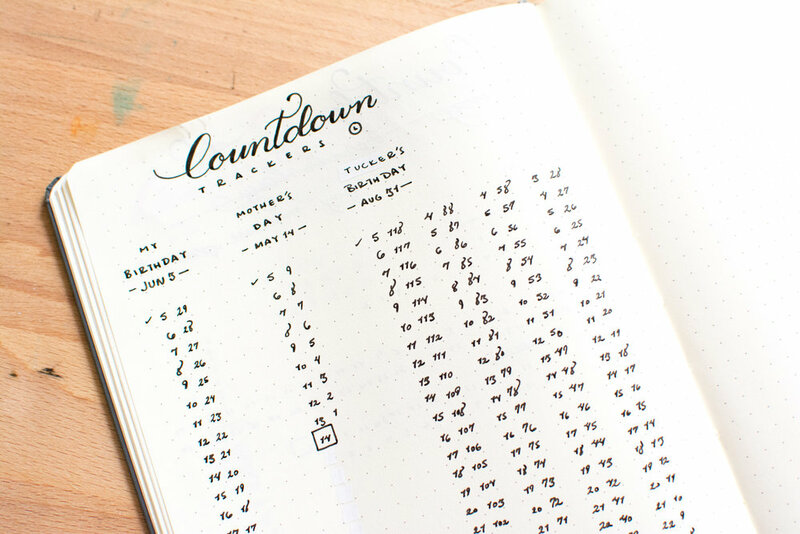 Draw a box around the special date so it's always at a glance. In the photo above you can see how for the third thing I am counting down (Tucker's birthday), I wrote the number 5, for today, the 5th of May since today is the day I started tracking. After that, I went to this website to calculate how many days until his birthday on August 31st. It turns out that it's 118 days until his birthday. So I proceeded to countdown starting with the number 118 until I reached number 1. After that, I wrote down days of the months until August 31. This means that I wrote down the remaining days of May, and all the days for June, July, and August. Here's the finished product where you can see how it all works together. I use a checkmark to indicate which days have passed to know what day it is, and all I need to look at the number to the right of it to see how many days until the special day. Some of the links used in this article are Amazon Affiliate links, such as the items below, which means that if you make a purchase through them, I will make a commission at NO extra cost to you. Thank you for your support in helping keep Tiny Ray of Sunshine running!